Watercolor is a lively, fluid medium with an element of unpredictability that can make it seem intimidating. How to Draw and Paint: Watercolor Basics is here to take away the guesswork and teach aspiring painters everything they need to know to start making beautiful watercolors. In these pages, readers are led through a series of step-by-step projects covering a variety of subjects, including landscape, still life, and portrait. 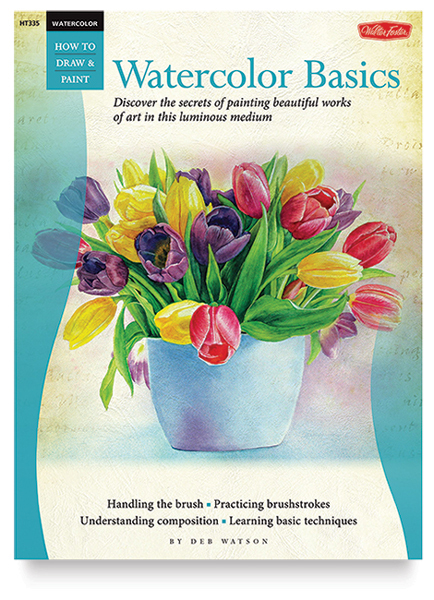 Easy-to-follow demonstrations clearly illustrate how to mix colors, render light and shadow, capture textures, suggest mood or time of day, and bring dimension and depth to watercolor works. Geared toward beginners, the book also includes a comprehensive introduction to tools and materials and provides an overview of basic color theory. Paperback. 32 pages. 10¼" × 13¾" (26 cm × 36 cm).